Behind-the-Scene Featurettes, Deleted Scenes and More! CULVER CITY, Calif. (Dec. 5, 2017) – Luke Evans (Beauty and the Beast, Fast & Furious 6), Rebecca Hall (Christine, Vicky Christina Barcelona), and Bella Heathcote (Fifty Shades Darker, Dark Shadows)star in the biographic drama PROFESSOR MARSTON AND THE WONDER WOMEN, debuting on Blu-ray, DVD, and Digital on January 30 from Sony Pictures Home Entertainment. PROFESSOR MARSTON AND THE WONDER WOMEN is based on the bold and illuminating true superhero origin story depicting the creation of the beloved comic book character ‘Wonder Woman’ in 1941 by Dr. William Moulton Marston (Luke Evans), the Harvard psychologist who helped invent the modern lie detector test. Marston’s polyamorous relationship with wife Elizabeth Holloway (Rebecca Hall) and their lover, Olive Byrne (Bella Heathcote) was key to the creation of Wonder Woman as their feminist ideals were ingrained in the character from her creation. Written and Directed by Angela Robinson (“True Blood”), PROFESSOR MARSTON AND THE WONDER WOMEN also stars JJ Feild (Captain America: The First Avenger) with Oliver Platt (Frost/Nixon) and Connie Britton (“Nashville”). 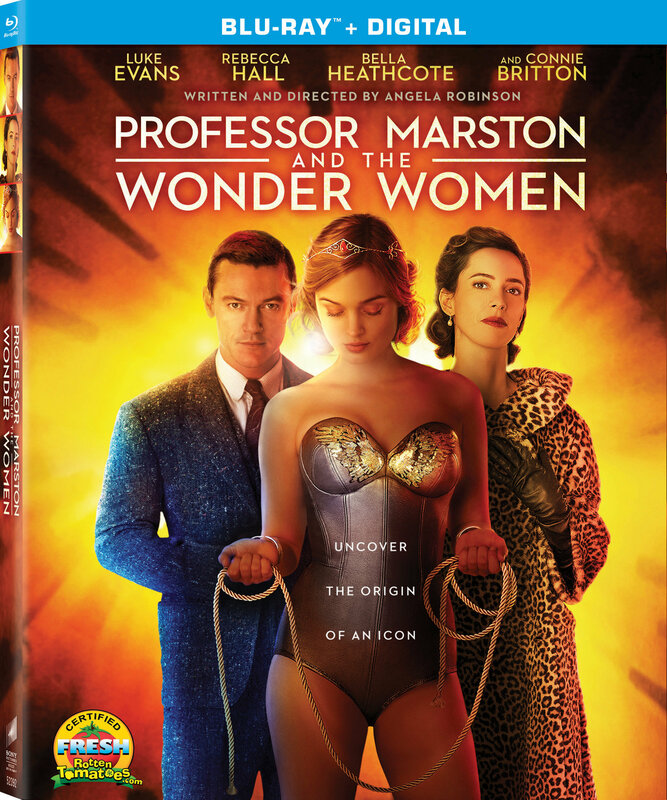 The Blu-ray release of PROFESSOR MARSTON AND THE WONDER WOMEN features revealing bonus material including deleted scenes, two behind-the-scenes featurettes, and a special motion comic revealing “The Surprising Secret Identity Of Charles Moulton”, the real psychologist and inventor of the lie detector and ‘Wonder Woman.’ Learn more about writer/director, Angela Robinson’s exhaustive and passionate research into this story and its characters in “A Crucial Point of View: Directing – Professor Marston And The Wonder Women.” In “A Dynamic Trio: Birth of a Feminist Icon,” stars Luke Evans, Rebecca Hall, and Bella Heathcote reveal how the loving, yet alternative relationship between their characters informed their performances. From Annapurna Pictures in association with Stage 6 Films, PROFESSOR MARSTON AND THE WONDER WOMEN is written and directed by Angela Robinson. It was produced by Terry Leonard and Amy Redford and executive produced by Andrea Sperling and Jill Soloway. PROFESSOR MARSTON AND THE WONDER WOMEN has a run time of approximately 108 minutes and is rated R for strong sexual content including brief graphic images, and language. Own “Geostorm” on Blu-ray combo pack and DVD on January 23 or Own It Early on Digital on January 16!